It’s no secret that Rihanna loves London and frequents the area often. In this installment of Vintage RiRi we will discuss a look she wore on a nice day back in August of 2012. On this occasion, she wore quite a few pieces from Paris-based brand, Kenzo and more. Rihanna started her look with a collaborative hat from Kenzo Paris and New Era. 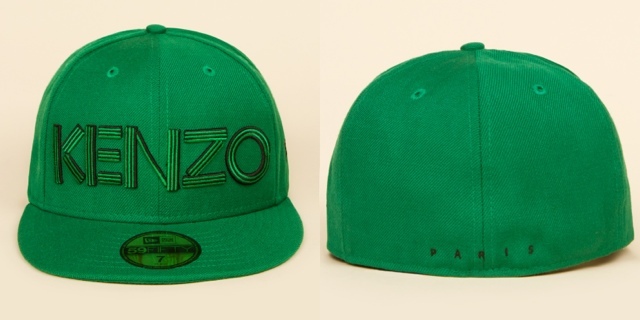 This hat retails at $60 and features the Kenzo brand name in big letters across the front of the cap with “Paris” in small capital letters on the back. Unfortunately, this item is on back order at Opening Ceremony. Rihanna wore sunglasses from New York-based brand, Illesteva. The Illesteva “Frieda” sunglasses are unisex and feature a classic chunky round style available in a variety of cool colorways. 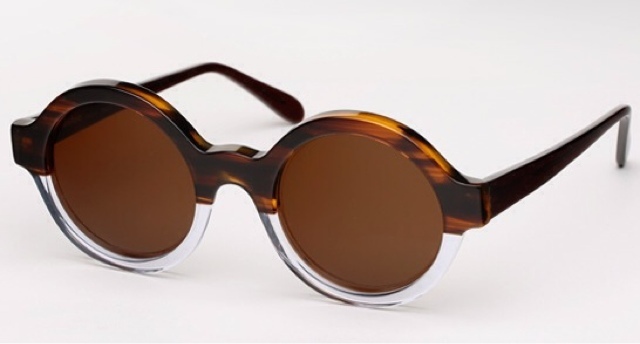 You can purchase Rihanna’s two-tone tortoise clear split sunnies named “Half/Half” at the link below for $200. Rihanna then wore a sweatshirt that was also designed by Kenzo Paris. This striped Eiffel Tour Logo Sweatshirt is inspired by trips to Paris and to the brand’s original “Jungle Jap” store on rue Vivienne. Striped like a traditional French favorite, the comfy crewneck is a little piece of Kenzo history remastered by Carol Lim and Humberto Leon. Unfortunately, this exact piece is sold out. But you can get the same top with a different colored Eiffel Tower graphic (here) for $275. Rihanna finished this look with a Levi’s cut off shorts and a pair of ankle boots from Chloe Sevigny for Opening Ceremony. These lace up boots debuted in Chloë’s Resort 2011 Collection. But in collaboration with Opening Ceremony the brand kept Chloë’s signature wooden sole and re-upped the style in matte black canvas. These leopard Mary Ellen boots feature a 6″ wooden heel and are currently on sale for $132 at the link below. They are regularly priced at $440. Rihanna later wore another pair of Mary Ellen boots during the photoshoot for her Unapologetic album booklet. You can get the deeds on everything she wore during that photoshoot and the shoot’s outtakes (here). Rihanna accessorized with a bag from Gucci. This limited edition Boston Bag is from their Flag Collection. 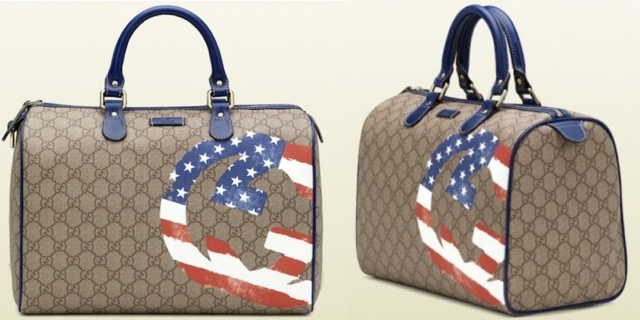 This bag features the USA flag printed inside of interlocking G’s on the top corner. The monogram bag features the USA flag displayed as an interlocking G. Up until December 31st of 2012, 25% of the retail price of this bag was donated to UNICEF in support of “Schools for Africa” and “Schools for Asia” education initiatives.